My focus this week was on figuring out how the recent development that The Girl, Trisha, has a physical impairment would fit into The Story. Jamming on this idea has also been helpful for me in practicing awareness of everyday situations because during idle seconds of my day, I’d look at a situation and think about how she’s tackle the issue. The Girl is ambitious, so she would go about her day with a fold-up wheelchair and portable cane, then use either depending on the situation. The intent would be that she would want as little outside assistance as possible, perhaps only asking The Boy to carry the fold-up wheelchair up some stairs without nearby ramps. That raised a deeper question: how would their relationship be realistic? The beginning framework of The Story is that The Girl reaches out to The Boy via instant message and they chat almost nightly for years. I have a good idea on how that would work. She’d send a “hi :)” and he would respond “Hello.” What leads to The Conversation? Building The Post is the foundation for both characters. In high school, The Post was going to be an opinion piece like a long reply on a message board post, though now with casual reviews on social media websites being a thing, The Boy would probably write a particularly insightful review about a videogame that they both enjoy. EarthBound has always been the placeholder for that game, especially relevant with its progressive take on inclusiveness, allowing the player to play through most of the game only needing to use a left hand. So maybe The Boy would also have a physical impairment? Maybe with his right hand? That shared impairment would fit in with events I’d brainstormed! The pairing also reminds me of the armless man carrying the legless man in El Topo. I always appreciated how Alejandro Jodorowsky cast actors like these not as a source of entertainment but to inspire deeper thought. Finally, let’s return to the start. 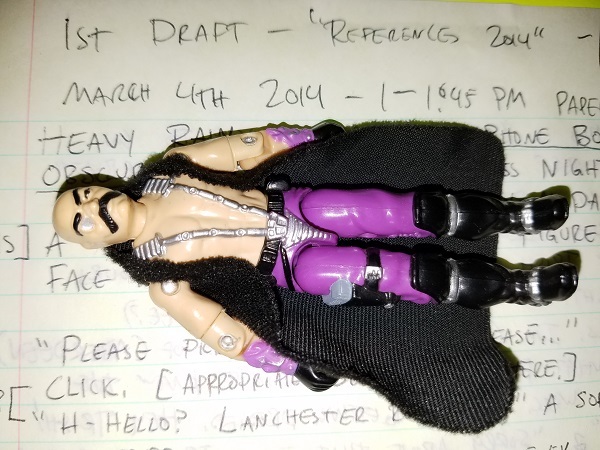 The photo, with Dr. Mindbender obscuring some details, is one of the only drafts I’ve written related to The Scene since my high school efforts under the working title of “References.” I’ll type, edit, and post this draft soon enough. I’ve been distracted from writing The Story for too many years. If it’s the project I really want to write, then why not work toward it daily? So, yes, a weekly feature about The Story will be good.